Based on environmental samples collected in 2016 and 2017, measured concentrations of metals and other chemicals in air, soil, and water "aren't likely to harm health" near the Precision Castparts Corporation PCC Structurals plant on Johnson Creek Boulevard. That's the conclusion of an Oregon Health Authority (OHA) Health Assessment Program report, which was released on October 29. 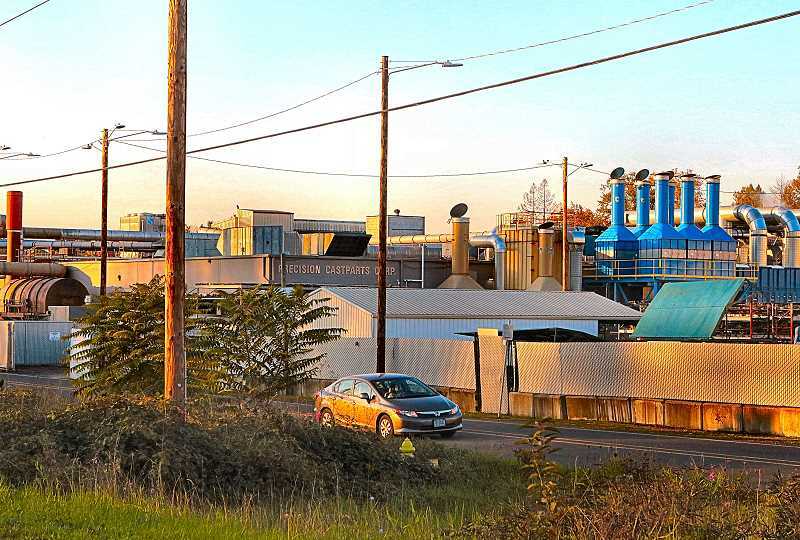 The report was the result of a request in June, 2016, by a neighborhood advocacy group, the South Portland Air Quality Group (SPAQ), that the Oregon Health Authority (OHA) conduct a public health assessment for the area surrounding Precision Castparts in Southeast Portland. The resulting public health assessment found that levels of metals including arsenic, cadmium, chromium, and nickel detected near the metal components manufacturer's S.E. Harney Drive facility are below any levels that would be expected to harm public health. Whether or not those living near the plant could have been harmed before the studies began remains unclear, the report states. "Based on currently available science, guidance from federal agencies, and Oregon Department of Environmental Quality environmental monitoring data, we concluded that the risk to the health of people living and working in the area since 2016 is low," wrote Susanna Wegner, Ph.D., the OHA public health toxicologist who led the Precision Castparts assessment. OHA pointed out that a scientific appraisal of potential negative health effects from exposures to the metals and other chemicals prior to 2016 was not possible, due to a lack of historical sampling data. "What we are unable to say confidently is the extent to which people were exposed, or whether their health may have been harmed, before the air, soil, and water samples were collected starting [in 2016]," Wegner commented. Other limitations the report cited were uncertainties about how well the available monitoring data represents typical ongoing exposures, uncertainties about potential effects in sensitive populations, and an inability to differentiate between emissions from the Precision Castparts plant and those from other sources in this industrial district. This recently released report has not been certified by the Agency for Toxic Substance and Disease Registry (ATSDR) – because, in early 2018, that body changed its criteria for certifying public health assessments, which allow only assessments of Superfund sites through the certification process – and Precision Castparts is not a Superfund site. Because of that development, the OHA Environmental Health Assessment Program allocated $5,000 to hire, in consultation with the community advisory committee, an external consultant who will conduct a third-party review of the assessment, OHA says. "We have ensured the Precision Castparts public health assessment follows ATSDR methodologies for health risk assessment," Wegner assured. OHA has scheduled a public meeting to share the results of this Precision Castparts public health assessment on Thursday, November 29; with an open house involving OHA and DEQ staff starting at 6 p.m., and at 7 p.m. an OHA presentation on the findings followed by question and answer time, led by external facilitators. It takes place at the Lane Middle School Library, 7200 S.E. 60th Avenue.